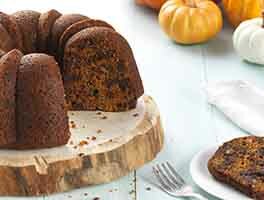 If you've ever traveled to the Caribbean, chances are you've had the amazing rum cakes that the islands are famous for. 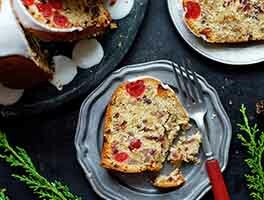 Sadly, these cakes are not often found in northern latitudes; but this recipe is the closest we've ever had to the real Jamaican thing. 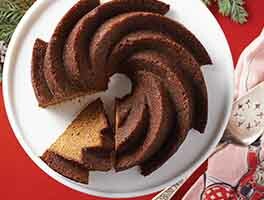 It’s also a delicious clone of the dense rum cakes you’ll find in Italian markets during the holidays. Yes, there’s a lot of rum in this cake, and it's definitely not for those avoiding alcohol. But the incredibly moist texture and rich flavor are deeply satisfying. Weigh your flour; you’ll find its weight by toggling to “ounces” at the top of the ingredient section above. Or measure it by gently spooning it into a cup, then sweeping off any excess. Place the flour, sugar, pudding mix, baking powder, salt, butter, and vegetable oil in a mixing bowl, and mix at medium speed until everything is thoroughly combined and the mixture is sandy looking. Beat in the milk, then beat in the eggs one at a time. Scrape the bowl thoroughly, and beat briefly to recombine any sticky residue. Stir in the rum, vanilla, and butter-rum flavor. 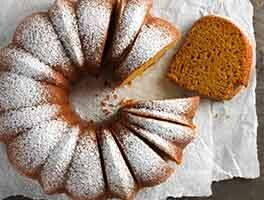 Spritz a 10- to 12-cup Bundt pan with cooking spray. For an extra layer of nutty flavor, sprinkle the inside of the pan with almond flour and turn the pan to coat evenly; shake out any excess. Pour the batter into the prepared pan and spread level with a spatula. Bake the cake for 50 to 60 minutes. When done, a cake tester, long toothpick, or strand of uncooked spaghetti will come out clean when inserted into the center. Remove the cake from the oven. Leave the cake in the pan to cool slightly while you make the syrup. In a medium-sized saucepan combine the syrup ingredients, except vanilla. Bring to a rapid boil then reduce to a simmer and cook (without stirring) for about 5 to 8 minutes, until the syrup thickens slightly. Remove from the heat and stir in the vanilla. Use a long skewer to poke holes all over the cake. Pour about 1/4 cup of the syrup over the cake (still in the pan). Allow the syrup to soak in, then repeat again and again until all the syrup is used. Cover the pan loosely with plastic wrap and allow the cake to sit overnight at room temperature to cool completely and soak in the syrup. When ready to serve, loosen the edges of the cake and invert onto your serving plate. If the cake won’t release, don't force it. Place it in the oven, turn the oven to 350°F, and warm for about 10 minutes, to soften the sticky syrup. (If your oven is one that preheats by making its upper element red-hot, place the cake on a lower rack and tent it with aluminum foil to protect it.) Remove the cake from the oven, and tip it onto the serving plate. Wrap securely (or place under a cake cover) and store at room temperature for several days. Freeze for longer storage, up to 1 month. Want to omit the pudding mix? You can; your cake will be a bit less sweet, and somewhat drier. Be aware we've tried substituting cornstarch, sugar, and extra vanilla for the pudding mix, and the result just isn't the same. Using the full amount of syrup in the recipe makes a traditional rum-soaked rum cake, one that’s incredibly moist. For a cake whose texture is more similar to that of a standard cake, make and use just half the amount of syrup. For cake with rich, buttery, vanilla flavor and undertones of rum — Cake: Substitute water for the rum, and use 1/2 teaspoon butter-rum flavor. Syrup: Substitute water for the rum, and add 1/4 teaspoon butter-rum flavor when you add the vanilla. Note that our butter-rum flavor is a professional-quality, extra-strong flavor; if you’re using store-bought rum extract, you’ll probably need to use more. For cake with more assertive rum flavor — Cake: Substitute water for the rum, and add 3/4 to 1 1/2 teaspoons butter-rum flavor. Syrup: Substitute water for the rum, and add up to 1/2 teaspoon butter-rum flavor when you add the vanilla. OMG, Can we say delicious melt in your mouth good? Baked this for my co-worker on Saturday and delivered on Monday for her birthday!!!!! Wow it was delish. I made this cake for the first time. It looked beautiful in the oven, nice and high with a separation around the top, similar to a pound cake when it is done. It tested done with a wooden skewer. However, about fifteen minutes after taking the cake out it fell and seemed to shrink away from the sides of the pan. I did not have a bundt pan so I used a regular tube pan. What happened? 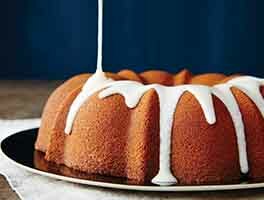 I absolutely love this recipe but I cannot cook the syrup that long or let the cake cool too much, otherwise the liquid does not seep through very well. I have made this at least 8 times now. I just have one question: a couple of time my cake has kind of 'doubled' over on the sides. Almost two donuts on top of each other. Any thoughts on why this happens? I made this recipe for a dinner and it was stupendous. I have never eaten rum cake before but I always thought it would be dry. The only thing I did different was used powdered milk and 1/2 rum and 1/2 spiced rum. I blended almonds into dust and coated the pan. So many wonderful tastes. People are already asking me to bring this to every dinner. Thank you. I made this cake several times. I followed the instructions and it was perfect each time. Now it's requested for every family gathering. Tastes better than the rum cake you get in Jamaica. So decadent and moist. I only used about half of the rum syrup and it was plenty. Reserved the rest on the side in case anyone wanted to add more to their cake. Warmed it up before serving and it came out perfectly. Delicious! Perfect result and very easy to make. Delicious! I'll be baking this tomorrow and am super excited! I was wondering if you could use coconut flour for the pan dusting as I read of others using ground coconut? Also, what would be the best/potent rum (not spiced) to use that would still taste amazing? Also, would you add pineapple (or even dried pineapple soaked in rum overnight) or raisins to something like this? Many thanks and I'll be back to re-rate after I experiment a few times!